It's about time to make another game that exists just to take up blank space on a press sheet. This one happens to be in color! 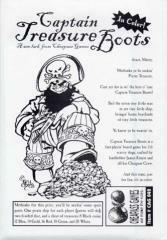 Captain Treasure Boots is a quick little board game about, you guessed it, Pirates. Sail the bounding main and gather a hold full of treasure, shooting your enemies to smithereens and taking theirs, too.